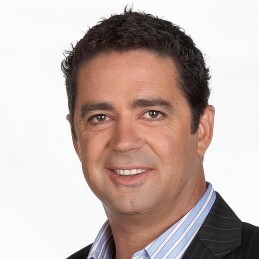 Garry Lyon is a standard-setting model of athlete turned media star. After finishing his AFL playing career, Garry was awarded ‘Outstanding Performer of the Year’ by the Australian Football Media Association which was quite an achievement for someone new to the media. The following year he was awarded ‘Special Comments of the Year’. In 2010 he confirmed his standing as a respected journalist by winning the Alf Brown Award for excellence in the football media and also ‘Best Print Columnist’. Garry has received continued praise for his work on the Nine Network. Replacing the departing Eddie McGuire as co-host of The Footy Show with James Brayshaw, the show has continued to lead Australian broadcasting in AFL entertainment programming. 2007 saw Garry become the host of hard hitting Monday night program Footy Classified on Nine. The show features in-depth analysis of club, administrator and player performances. The versatility of Garry’s media abilities were ever present during Nine’s coverage of the 2006 Commonwealth Games and 2010 Vancouver Olympics. Gary was a key signing during the formation of 24-hour sports radio station SEN 1116. His major role, hosting weekday breakfast show Morning Glory, strengthened the reputation of the new network. Following a stint at 3AW, Garry is now part of Triple M radio’s coverage calling Friday night and Saturday afternoon matches. Garry has co-written seven books in the Specky Magee series which aims to get young children excited about football and reading. Drawing on his knowledge of the game from his playing days, Garry continues to write a column for The Age newspaper in Melbourne. Garry was a star of the AFL through the late 80s and early 90s with the Melbourne Football Club. Recruited from Kyabram he played as a key forward or defender, captaining Melbourne from 1991 to 1997. He also captained Victoria, a team he would represent 10 times in State of Origin competition. He retired in 1998 as a five time All-Australian and member of the Melbourne Team of the Century. In 2010 Garry joined the AFL in a game development role with involvement in the AIS-AFL academy and coaching the Vic Country side at the 2010 NAB AFL under-16 championships. Previously he had coached the Australian team in an International Rules tour of Ireland. Despite being forever linked to the Melbourne football club, Garry’s following goes beyond club loyalties with his popularity equal among men, women and people of all ages. Garry is an ambassador for National Australia Bank, a key partner of the AFL. His role has seen him in grass roots football programs and corporate community and charity work.